Antique Brass: Finish on hardware that has a brown color. Backset: The distance from the edge of the door to the center of the hole drilled for your entry set knob, lever or deadbolt. Beveled Doors: Windows set in the doors frame which contains intricate glass work. Brickmold: Exterior trim that covers seam between jamb and wall. Caming: Metal parts of the glass design. Metal options include lead, brass, copper, zinc (silver), or patina (black). Casing: Interior trim that covers seam between jamb and wall. Composite Doors: Very durable in all climates; Even better then Fiberglass; & virtually maintenance-free. Custom Doors: CR Doors sells a verity of Quality Custom Doors, in all colors, makes and styles. The products we carry vary from the mid-range to very high-end doors, with a sufficient selection to satisfy anyone's style and budget. Custom Entry Ways: Front Doors, which can be customized to fix your styles, colors, and sizes. Custom Glass: Original pattern of beveled and stained glass panels. Cylinder Bore: Refers to a machining procedure that requires a round hole to accommodate a standard entry set. Deadbolt: Locking mechanism for an entrance door or other door. Deadbolts can be a single cylinder or double cylinder. With a single cylinder deadbolt, a key is used on the outside and is turned by hand on the inside. With a double cylinder deadbolt, a key is used on both sides. Double cylinders are only recommended where no one needs to go through a door in case of an emergency. 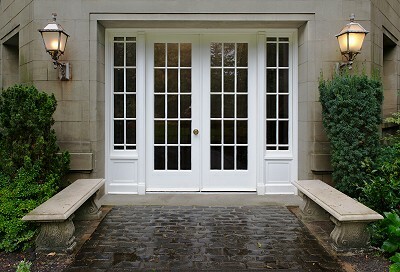 Exterior Doors: Doors found on the outside of the house, designed to weather outdoor elements. Frame: The set of jambs that holds the door unit together. The door is pre-hung in the frame. Flush Bolts: Bolts mounted in a door to lock a door in place. These bolts slide up into the jamb above the door and down into the threshold or floor below the door. They are primarily used on double doors where one door is locked in place and the other door is the one mainly used (active door). When needed the door locked in place with the flush bolts can be opened. Flush bolts are housed in a T-Astragal. French Door (one light): A door with one full panel of glass not separated by muntons. French Door (five light): A door with five panels of glass separated by muntons. French Door (ten light): A door with ten panels of glass separated by muntons. French Door (fifteen light): A door with fifteen panels of glass separated by muntons. Hinges: The metal objects that attach your door to the jamb, normally with screws. They can be made from brass, steel, iron or other metals. Hurricane Doors: Offer full-time protection against flying debris and hurricane-force winds without the expense of unsightly shutters. Inswing: When the door opens into the house when opened. Interior Doors: Doors used to separate rooms with in a house, not necessary built to weather the elements. Jambs: The wood that surrounds the door unit. This is your frame to which the door unit (door, doors, and/or doors and sidelights) is attached. Knob: Round part of door handle that you hold with your hand. this can be made of brass, porcelain, steel, glass, iron or other products. Left-Hand: Term used to describe which way a door is hung on the jamb. As viewed from outside, the side the hinges are on and the door swings into the house. Lever: Has the same function as a knob, except is longer and thinner. To open a door, levers are pushed down. Beside the decorative uses of a lever, they are also used in applications where someone is handicapped and cannot grasp a knob very well. Machining: The preparation for the entry set so that it will operate properly in the door. (see Bore and Mortise). Mortise: An elaborate machining process for special entry sets called a mortise lock. Mullcap: Interior and exterior trim for seam between door and sidelight. Muntons: Trim that holds panels of glass in the door which makes a style of a French door, such a five light, ten light, etc. Outswing: When the door swings to the outside of the house when opened. Panel Doors: Typical have intricate design carved into the wood of the door frame. Pre-Hang: Doors or combinations of doors and sidelights put together with jambs, hinges, threshold, T-Astragal, and trim to make a total working door system (a unit). Right-Hand: Term used to describe which way a door is hung on the jamb. As viewed from the outside, the side the hinges are on and the door swings into the house. Rough Opening: The opening for your door and/or sidelights before any framing material has been applied. Stained Glass: Colored glass organized in patterns to create works of art. Historicaly colours were painted onto the glass and placed in a furnace to anneale. Today "stained glass" is often manufactured diffrently with the metallic salts and oxides forged within the glass. Sidelight: Fixed panel of wood and glass next to door. Sliding Patio Doors: Doors set on tracks which open by moving to sideways. Slab: Door only or sidelight only. No frames, jambs or parts added to make door operate. T-Astragal: Vertical piece of wood attached to the inactive door of a double door unit. It houses the flush bolts. Transom: Fixed window light mounted in the wall above the door. Unit: All parts needed to hang the door and/or sidelights.The parts include Jambs, Hinges, Weather-stripping, Casing, Brickmold, Threshold; Flush Bolts and a T-Astragal on double doors and a sweep on an inswing unit. Wood Doors: Doors made of wood, hold a natural traditional look, which matches most architectural looks. They do require a bit more upkeep.